The Ballad of Robin Hood at the Southwark Playhouse, London. With Nottingham still on my mind, I decided to get more of my Robin Hood fill by catching The Ballad of Robin Hood at the Southwark Playhouse this past weekend. For the past twenty-one years, the Southwark Playhouse, has been known for showcasing and supporting up and coming actors, promoting youth and community programmes, and rebooting classic plays. It’s a fantastic studio theatre in the heart of London. 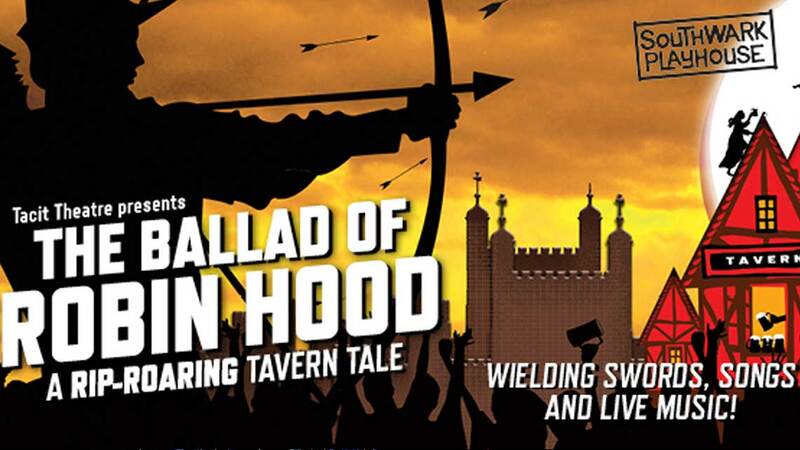 Over the holiday season, Southwark Playhouse is presenting their reinterpretation of The Ballad of Robin Hood . I wasn’t quite sure what to expect; it’s been billed as a cross between, ‘Games of Thrones meets Robin Hood’. I can assure you, it’s most certainly not. There is nothing remotely scandalous, bawdy or violent about this show, in fact, it’s completely geared for kids. I attended a matinee and I think I was the only person in the audience who wasn’t accompanying a child. That being said, I still enjoyed the show. What is the play about? It’s a interesting tale set in 1380, in Southwark’s famous Tabard tavern, a tavern that existed in the fourteenth century and was host to criminals, prostitutes and all sorts of unsavoury characters. The tavern is probably most famous for being mentioned in Chaucer’s The Canterbury Tales , as the starting point of the pilgrim’s journey. The Tabard used to sit in the same square as the famous George Inn. The Tabard burned down in 1669 and was reinvented as the Talbot, but that was torn down in 1873 and all that is left of the famous medieval tavern now is a blue plaque commemorating where it once stood. Rosalind Blessed as the storytelling innkeeper, Rosie Bailey at the Southwark Playhouse in, “The Ballad of Robin Hood”. The Ballad of Robin Hood starts out with the Tabard’s boisterous innkeeper, Rosie Bailey (Rosalind Blessed) recounting the hard times she’s going through; she’s being squeezed for taxes, and barely has enough to eat. In the midst of her complaining, she decides to tell a strange tale about Robin Hood coming to Southwark. The rest of the play is the story of Robin in Southwark unfolding, with Rosie popping in and out in the role of narrator. Robin is captured by a local, haughty sheriff, (played by Tom Daplyn) for stealing his badge of office. The sheriff is a great character; there are a few lines uttered by him as a humorous poke at certain modern day political situations. It’s cleverly dropped into the dialogue to get a chuckle from the adults in the audience. Daplyn’s sheriff is well played-up to be a stereotypical, grasping, noble who wants to line his pockets by being the one to hand over Robin. The injured Robin is hauled into the Tabard, and about to be handed over to the King when he manages to stall for time by telling everyone in the tavern how he came to be in London and why they shouldn’t judge him so harshly. Owen Findlay does a great job as the dashing, devious, but just, Robin Hood. He plays up the bravado as the flirtatious outlaw and is well matched with a strong, and wilful Marion, (played by Dora Rubinstein). There are hints of romance here but it’s all very PG. Joel Mellinger, Oliver Ashworth and Ellen Chivers round out the cast as the musicians and other Tabard patrons who argue for and against turning in Robin to the king. The Ballad of Robin Hood is a fun, fast paced, light-hearted romp. It’s musical theatre at it’s best – lots of fun songs, quick scene changes, witty exchanges, and a wink to the audience who are treated as patrons in the pub, listening to a tale. It was amusing, clever, and entertaining. It’s only an hour and fifteen minutes long, and easy on the wallet, costing only £12 for a 3pm matinee. If you’re in London, and looking for a fun, affordable, ‘medieval-lite’, afternoon, this is the perfect show to see with the whole family. The play runs until December 26th.